The Victoria is a solid, attractive hotel in the seaside village of Bamburgh. Bambugh boasts plenty of attractions, including a castle, a pretty green and some lovely old stone cottages. But the stand-out reason to visit is its beach, which is biggest beach in the North East and one of the best in the country. It stretches on forever, linking Seahouses in the south to Bamburgh Castle and beyond in the north. Eat: The restaurant menu is extensive and quality impressive, with local dishes such as Northumbrian steak and ale gourmet pie and North Sea beer battered haddock complemented by fancier foreign fare such as spiced Moroccan lump of lamb and slow-cooked beef bourguignon with Toulouse sausage. For puddings try Bailey’s Irish crème brulée or lemon cheesecake with poached rhubarb. Sleep: This smart hotel was tastefully refurbished in 2012 and as many as 28 out of its 36 beautiful rooms welcome dogs. These rooms are spread over three floors and combine standard doubles, twins and superiors, so there is plenty of choice. Water bowls and biscuits are provided in all of them – you just have to supply your dog’s bed. All are well-appointed and have been fashionably redone, with big lamps, contemporary four-poster beds in some, and seasidey touches across all. 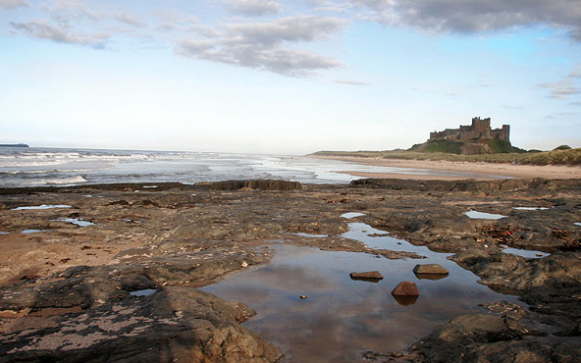 Walk: When you are ready for a walk, you just have to head over to the vast swathe of dune-fringed sands onto the award-winning Bamburgh beach five minutes away, with the brooding ramparts of the castle on one side and the world famous Farne Islands on the other. There is space for everyone, from dog walkers to horse riders and surfers – and dogs are allowed everywhere, with dog bins provided. The hotel does a great takeaway fish and chips for just £5 – perfect for taking to the beach.